Monochromatic colors have never been so powerful like now in the interior design world, the best interior designers guess that this year people will risk as never before in their home decor. As usual, Pantone announced its color of the year: Purple UltraViolet. Now the WGSN, the trends agency that forecasts everything about the subject when it comes to fashion and decoration. These Color Palette, which brings back, with a new look, the powerful and vibrant tones that dominated the aesthetics between the 1930s and 1960s. See the list of 10 chromatic trends that will invade your home design during the year 2018. Whoever thought that Millennial Pink was going to say goodbye to the spotlight, it was wrong. The darling color of everyone evolved and gained a dose of orange in its composition, getting a little less smooth and more energetic. Red will be one of the strongest colors, but it will emerge in darker, rich tones, close to reddish brown. Woody and warm nuances should be seen in both large modern furniture and smaller items, continuing the use of a darker palette in the decor. Lightly toned whites gain power, as they are the perfect complements for very light or very dark environments. The palette is similar to the candy colors, but is softer and presents colors that, at a first glance, do not seem to draw so much attention. Dark environments have never been so high. To make everything more interesting, surfaces that bring the metallic glow are joined to other well matte ones to create a game of perception. Green emerald, but in a darker and bluer palette promise to take care of the full walls and contemporary furniture. Blue appears strong to punctuate energy in environments through unexpected splashes of color. Green moss was one of the main colors of 2017 both in fashion and decoration. In 2018 it appears more acidic and close to the pistachio. The yellow drawn for gold appeared in fashion in mid-2017 and is already listed as one of the strongest trends for 2018 in decoration. Luminous and applied to tactile surfaces, this tone promises to bring vintage and energetic atmosphere at the same time. The earthy tones are a very strong palette at the moment and promise to remain in evidence for years to come. 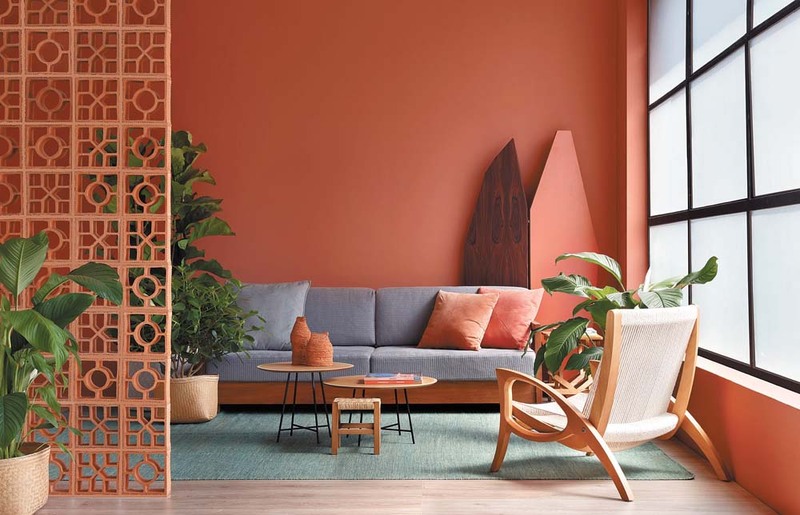 The terracotta gains more humor and personality by absorbing pigments, the perfect color to decorate residential interiors. Having vibrant colors contrasting in the same environment is the order of the day – and they can appear in both wall graphics and geometric prints as well as bold styling combinations.